Enfamil® PREMIUM™ now has Natural Defense™ Dual Prebiotics. We've improved the formula you trust to make it even more beneficial for your baby. Improved Enfamil PREMIUM with a unique, dual prebiotic blend now promotes the growth of good bacteria throughout more of your baby's digestive tract than our previous formula. Proven healthy development for your baby. 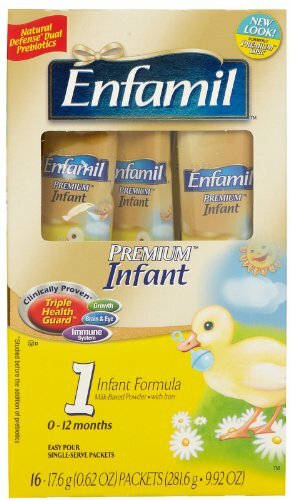 Improved Enfamil PREMIUM still has Triple Health Guard™. It's a clinically proven* formula to promote growth, to improve† brain and eye development, and to support the immune system too. Including new Natural Defense Dual Prebiotics and Triple Health Guard, Improved Enfamil PREMIUM provides your baby complete nutrition at every feeding, in a formula designed to help support his immune system. *Studied before the addition of prebiotics. †Studies compared infants fed Enfamil® with DHA and ARA vs discontinued Enfamil® without DHA and ARA; improvements shown to 12 months for visual development, 18 months for brain, and 3 years of age for immune outcomes.